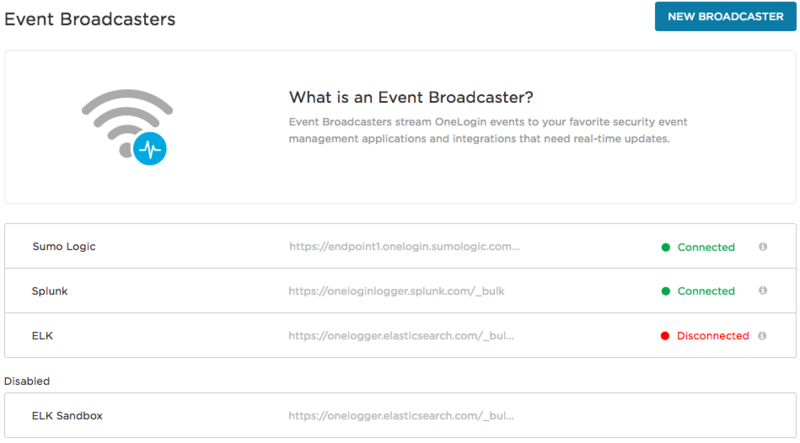 This article describes how to set up an Event Broadcaster to send your OneLogin event data to your SIEM (Security Information and Event Management) solution to gather, analyze, and display your events generated by OneLogin. 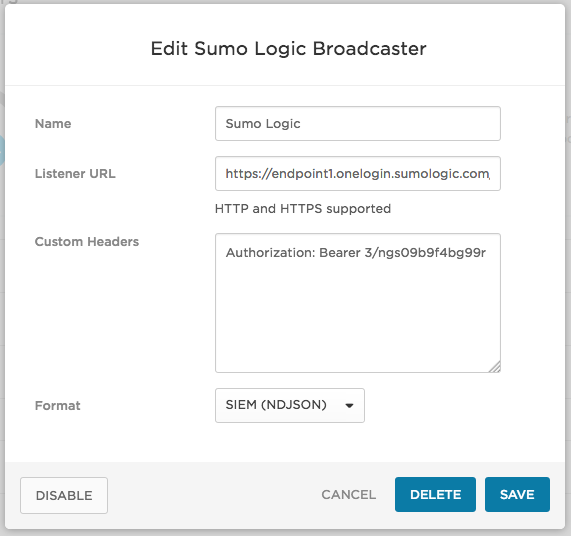 You can send OneLogin event data to any SIEM solution that accepts data in JSON format, including Sumo Logic, ELK, Splunk, and many others. The Event Broadcaster will send real-time event data in JSON format to a listener via an HTTP POST to the endpoint. It will make a POST whenever there are 10 events or every 10 seconds, whichever comes first. For detailed information about the JSON payload that OneLogin sends, see https://developers.onelogin.com/api-docs/1/events/event-resource and https://developers.onelogin.com/api-docs/1/events/get-events. Note. If you configure more than five broadcasters, you may experience latency problems during high traffic periods. SIEM solution that accepts data in JSON format. Subscription to the OneLogin Enterprise or Unlimited plan. For more details, contact sales@onelogin.com. Go to Developers > Webhooks. 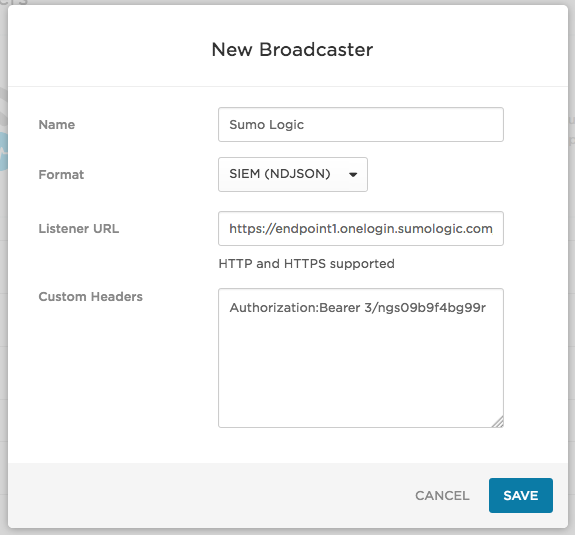 On the New Broadcaster dialog, enter a unique name for the broadcaster, a listener URL, and any required custom headers. Listener URL: This is your SIEM endpoint that will receive the events data. HTTP and HTTPS are both supported. Among other things, you can to use the header field to require a unique value to post to the endpoint. Format: Choose between JSON Array and SIEM (NDJSON), depending on what the listener expects. For example, Sumo Logic expects data in the NDJSON format. A new event broadcaster row appears on the Event Broadcasters page. If you need to edit event broadcaster values or disable/enable a broadcaster, click the broadcaster’s row on the Event Broadcasters page to display the Edit Event Broadcaster page. If the broadcaster is disabled, the Enable button appears. If it is enabled, the Disabled button appears. Click the button and click Save to change the state. Disabled broadcasters appear in the Disabled section of the Event Broadcasters page. We've provided a nifty open source event receiver that you can use to test your event broadcasters. You can get it at https://github.com/onelogin/broadcast_receiver.